Steps away from Nantucket town center and the many restaurants, museums, fine boutiques and restaurants the town has to offer. Just step through a gate to the historical picturesque Old North Wharf. The condo is located on the second floor of a 5 unit building overlooking Old North Wharf with views of the Easy Street boat basin. Kitchen is fully equipped with large breakfast bar, open living room, dining area, and half bath. The upstairs consists of one bedroom with double-size bed and full bath with shower stall. Deck with sitting area. Mid-aged professional couple currently living in Bethlehem, PA. Location, location, location! Newly renovated in 2014. No need to bring a car on island. Great deck to sit and relax. Private garden lined walk ways. Laundry room and bike racks on site. Walkable to shops, restaurants and boat marina launch. Portable AC in bedroom, window unit in living room. One flat screen in living room and one flat screen in bedroom with a built-in DVD player. Bike rack. Beautiful flower gardens, no lawn. 2 Beach Chairs & Towels, Beach Umbrella, cooler. Hidden Gem in a wonderful location! 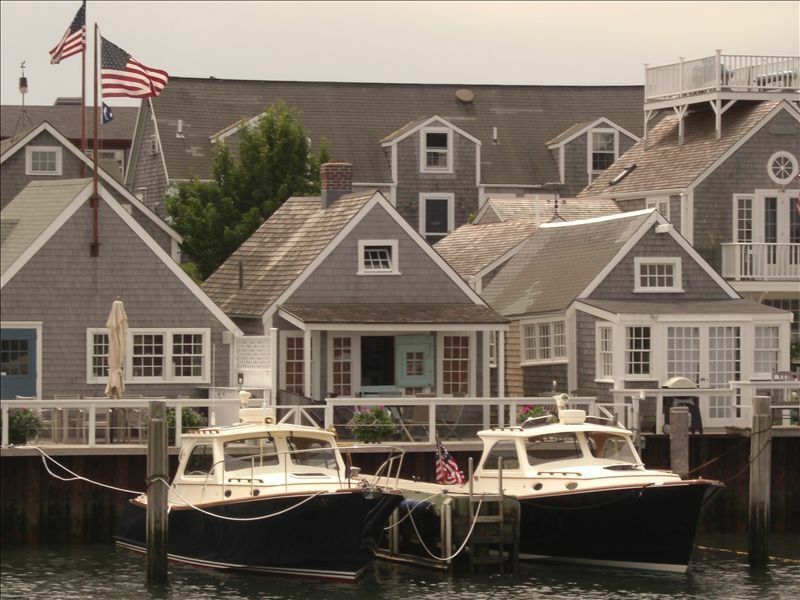 Tuck’d inn is a lovely apartment in the best location possible on Nantucket for quick access to Town and the ferries. It’s scrupulously clean and Nancy was very easy to work with. It’s very well equipped for anything you could want to do on holiday. We loved staying there. Property was as advertised. Small, but very nice, higher end appliances and everything needed if you did wish to prepare meals. Very comfortable and great location. Watch the steamship, etc., come and go. Even had a parking space which in town is unusual. Front door key area had a motion light--I would love to know where to find this product. My husband and I had a wonderful weekend at the Still Dock condo. It was the perfect location right in town, a short walk to all of our favorite restaurants. The condo was exactly what we were looking for, with a beautiful view of the harbor. Nancy was extremely organized and the place was impeccably clean. Would definitely stay here again! My husband and I loved this place so much, I'm not even sure where to begin. The rental is so cozy and comfortable that you feel at home the moment you step inside. It's the perfect size for two, and beautifully decorated. It has everything you'd need, right down to two great beach chairs with backpack straps that made for easy carrying to the beach. The best of it all is the location. It was very quiet, and yet we were a five minute walk or less to everything in town or the shuttle stops to get us where we needed to go. It was all so easy. Lastly, many thanks to owner Nancy, who has been excellent to work with and super responsive. Book this rental. It will make your vacation! Location is excellent and very convenient. The condo itself is immaculate with great decor. High recommend this place for a couple plus a child. It has everything you need and the beds (full and pullout couch) were very comfortable. A little loud in the morning due to the adjacent restaurant deliveries but that is really the only flaw. We can't wait to come back. Excellent location, great decor and accomodations, highly recommend! Thank you Jayme. You are welcomed back any time! Whaling Museum, art galleries, the Wave (shuttle buses to all beaches), shuttle bus to Cisco Brewery located in front of the Visitor Center on Federal St.